As a Box Business or Enterprise Admin, you’ve got the world of Google Apps right at your fingertips – right in Box. Read on to see how to integrate your Google Apps account with your Box account in a few quick steps. First, you’ll need to download copies of your files from Google Apps to your local hard drive (or external drive) to prepare for the upload to Box. (Note: Google limits these exports to 2GB at a time.) The files will be converted to non-Google formats (.pdf, .doc, etc.) during the export, but you’ll still be able to edit them in the Google Docs online editor. 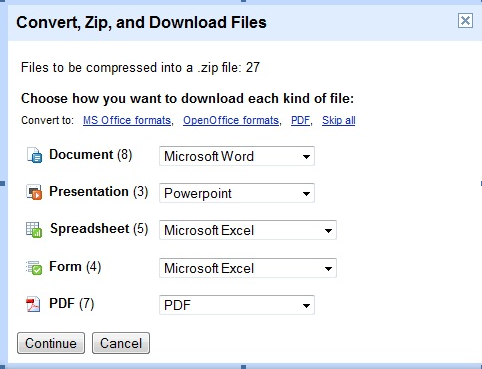 Once downloaded, all of your Google documents will be available on your desktop as one zip file. Your exported content is now located on your local or external drive. To get the content to Box, simply unzip the folder, then upload the content to Box with the Upload Folders tool.